The furore happened within the comment section of a recent throwback photo that 38-year-old Kim Kardashian posted to social media. In the photo, the young reality star smiled in a swimsuit in the 1980s and, while many people thought she looked like daughter North in the shot, youngest sister Kylie Jenner saw Chicago. 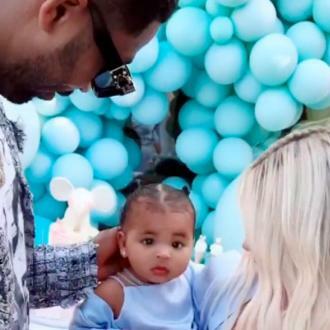 Kylie - who is also mum to Stormi, born in February this year - commented 'Omg Chicago,' which prompted a fan to suggest that Chi doesn't actually share Kim's DNA. The follower responded to Kylie in a now deleted comment that the child could only look like Kanye or the surrogate. Chicago is the couple's biological child. Khloe was not standing for the ignorant comment and responded to the user's 'silly' statement. She wrote: "If you don't really know about someone's situation then maybe you should not comment. Try informing yourself first before you make such silly statements doll. "Your passive wanna be petty comment is simply uneducated. Chicago is completely Kimberly's biological child. Praise the lord she was able to have a surrogate and that we are blessed with sweet gorgeous Chi Chi." Kim has frequently stated that her infant daughter is her spitting image and it has previously been reported she thinks it was God's plan for Chicago to be her twin. Kim has said: "I think I was so nervous to have a surrogate and to have that connection that God was like, 'I'm going to make her look just like you'."